Last month, when Kong: Skull Island started screening for the press, it was confirmed that there will be a post-credit scene, although no details about this scene were given. 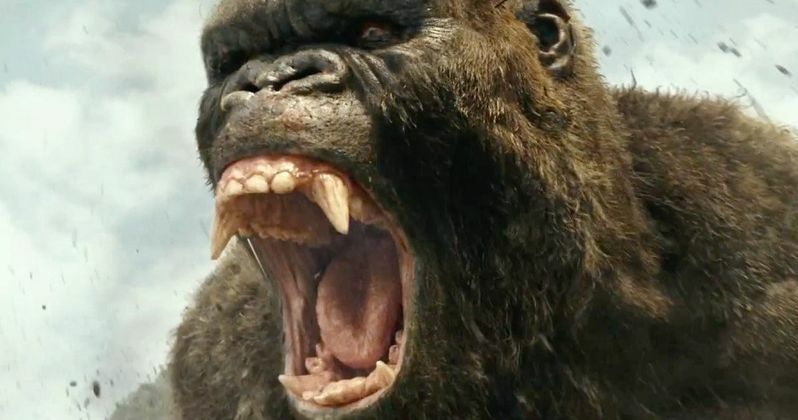 Reports later surfaced that this movie would help set up Warner Bros.' new Godzilla and King Kong universe, leading into the highly-anticipated Godzilla vs. Kong, which is slated for release in the summer of 2020. Today we finally have a description of the post-credits scene, which was shown during the movie's European premiere at London's Leicester Square. There will be SPOILERS below, so read on at your own risk. This report comes from Flickering Myth, who attended the premiere earlier this week. The sequence opens with a fun joke about post-credits scenes in general, with the scene starting over a black screen with Tom Hiddleston's James Conrad saying, "Why are you sitting in the darkness? Are you enjoying this?" It is then revealed that he is actually talking to the people behind a two-way mirror, with Conrad and Brie Larson's Mason Weaver being interrogated by the Monarch company. The company wants them to promise not to tell the Russians about what the found at Skull Island. James and Mason are then joined by Corey Hawkins' Houston Brooks and Tian Jeng's San, who reminds them about the point made earlier in the film by John Goodman's Bill Randa, that this is their world, meaning humanity, and they aim to take it back. They then proceed to tell James and Mason that Kong is not the only "king" on planet Earth, showing them slides of the nuclear blast that created Godzilla, as he's seen in the 2014 Godzilla movie, while then showing the duo cave paintings that depict the iconic monsters King Ghidorah, Mothra and Rodan, who have already been confirmed to appear in Godzilla: King of Monsters, which hits theaters on March 22, 2019. The final slide shows another cave painting of Godzilla and King Ghidorah fighting, which sets up Godzilla: King of Monsters. The post-credit scene comes to an end with Godzilla's iconic roar as the scene cuts to black. While it isn't specifically stated in this report, it seems that this scene is set in the 1970s, like the rest of the movie, but since 2014's Godzilla was set in present day, and Godzilla: King of Monsters will also presumably be set in present day, it remains unclear if there will be any attempt to bridge the gap in time between Kong: Skull Island and Godzilla: King of Monsters. Legendary recently set up a writers room for the Godzilla and King Kong franchises, which will be lead by Michael Dougherty, who recently signed on to direct Godzilla: King of Monsters, replacing Gareth Edwards, and Zach Shields. In the spirit of its worldwide blockbuster Godzilla, Legendary Pictures presents a bold new take on the mythos of another iconic beast with Kong: Skull Island, which stars Tom Hiddleston (The Avengers and Thor series). Directed by Jordan Vogt-Roberts (The Kings of Summer) and written by John Gatins (Flight) and Max Borenstein (Godzilla), Kong: Skull Island will fully immerse audiences in the mysterious and dangerous home of the king of the apes as a team of explorers ventures deep inside the treacherous, primordial island. Legendary's story honors the foundations of existing King Kong lore, but places it in an entirely new, distinct timeline. Thomas Tull (Godzilla, The Dark Knight, Pacific Rim) and Jon Jashni (Godzilla, Warcraft) will produce and Alex Garcia (Godzilla) will executive produce. Hopefully we'll get more details about this growing franchise after Kong: Skull Island hits theaters.